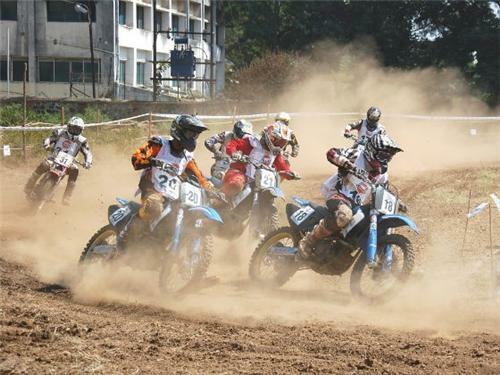 Dirt Biking is a common form of sport that originated in the west has been making inroads into India as well. The adventure enthusiasts in India have made it a point to bring this sport and popularize it through the establishment of requisite infrastructure. Needless to say, most of the effort has been concentrated in and around the city of Bangalore. To carry out this form of sport, one needs to have a track that has not been pruned. In fact, the rougher the track better is the experience. A rugged terrain can be a staple to produce a thrilling experience in dirt biking. The reason for the popularity of the sport in Bangalore besides the enthusiasm of its people is that the area around the city provides ideal environment to conduct the sport. Hills dot the localities around the city and several of these are ideal for dirt tracks with a little bit of preparation. Many a time, the experience of biking can relive your senses. Most people who practice this sport on a regular basis believe that it combines speed, adventure and the experience of crossing difficult terrain. Biking is best experienced in a cool weather. A very hot and sunny day will lead to a lot of exertion and you may not be able to appreciate the thrill of the sport. In Bangalore, the winter months from October to April are ideal for the sport. Monsoon may add a touch of thrill to the sport as the track may become slippery and difficult to navigate. However, trying out dirt biking in sloppy weather is not recommended by most. Dirt Mania, on the Kanakpura Road is a premier destination for adventure enthusiasts in Bangalore. Dirt Biking is one of its major attractions. The location of the center is just a few kilometers from the city center, thereby giving it easy access. Among the sports that can be enjoyed here, dirt biking is the most popular one. Dirt Mania provides high quality dirt bikes and quad bikes on rental basis. A large diversity of bikes is available here for all kinds of needs. Dirt biking can also refer to the use of quad bikes. The difference lies that these are four wheeled vehicles. Therefore, the width of the track required for this sport is also greater. Quad bikes can offer a similar but a safer experience. The starting cost for renting a bike at the place is around INR 250. Of course, this depends on the model of the bike. Despite the overwhelming increase in the popularity of the sport, the requisite infrastructure is yet to come into place. People can often be found riding quad bikes or even dirt bikes without adequate safety gear. Moreover, the trails around the city where these activities are arranged are often not surveyed properly, leaving scope for the occurrences of mishaps. The sport of dirt biking is yet to receive the form of overwhelming response. People mostly try for a one off experience. It would still take some time before it receives full-fledged attention.